Over the course of three days, artists from all over the area - professional, amateur, students and the public - will take to the pavement armed with pastel chalks to create masterpieces. The theme of the event is "Wit, Wonder and Whimsy". This is a family-friendly event to promote community through art making. All levels of artists are welcome. 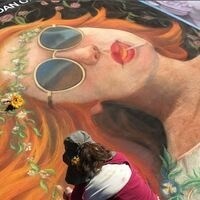 The Santa Clarita Chalk Festival is presented by the Old Town Newhall Association. Come chalk with us! Was very disappointed. Very little chalk work. Would of like to see more arts and craft, venders.